Kinda bad in that I cannot actually find a picture of this anywhere on the Internet, plus my webcam is not working, nor is my mobile phone. For this reason there will be no picture of what the Theme looks like. As it is coming up to Halloween I thought I would treat myself to Disruptive Medias Zombie Halloween Premium Theme. The theme is based on zombies rather unsurprisingly. 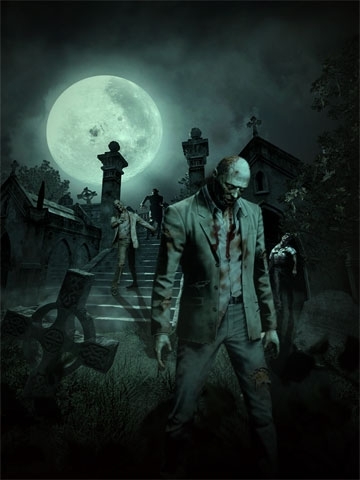 The Realm of the Dead Theme was based on a zombie street scene. This one is far more traditional. The background picture has a spooky realistic looking mansion in the centre. From the mansion are shambling zombies. On the left of the screen is what appears to be a giant monstrous tree made up of monsters, a pile of skulls at its base. The right side of the screen has a old gate leading to woods. A stone gargoyle stands on the gates pillar, and the trees of the wood has bodies hanging off of them on hooks. The incidental pictures are quite cool. These include a legless zombies with a chainsaw sticking out its back, a zombie holding a severed arm, a hung body with its insides spilling out, skeletons and more. The Theme cost 240 Microsoft points, it does look good, but the Realm of the Dead Theme is the better one. Still for Halloween I will have this Theme up (need to make my moneys worth on the expensive thing!) Wouldn't really recommend wasting money on this. General update for October - Halloween is coming!